Traditional African prints and patterns are becoming more and more popular in the fashion world these days. As you would expect, new fashion-forward companies are springing up with modern interpretations of these traditional styles, and old companies are scrambling to join the fray. So where can you get your hands on these great new styles? Well this spring, you can get your Vans West African style with the new Vans x Della collection. Della is a Los Angeles based fashion line that specializes in handcrafted, one-of-a-kind textiles made with sustainable materials from the west African region. The company is partnering with Vans to bring their brand of socially responsible fashion to the fore. The company’s partnership with Vans is just their latest move in partnering with major brands, and it’s prime evidence of their stellar business model; Della is fully owned and operated by women, employing more than 50 in the small town of Hohoe Ghana, where their one-of-a-kind textiles are hand crafted. I recently got a chance to chat with Della Los Angeles Marketing rep. Valeria Pulido, who described how the company’s vision for a socially responsible fashion line has grown to be a very exciting reality. Della’s founder, Tina Tangalakis, first visited Ghana in 2009, when a volunteer program brought her to Hohoe, a small town in the southeastern region between lake Volta and the Togo border. Tina quickly became enamored with the textiles of Ghanaian clothing wear and the friendly people she met. Keen on acquiring a souvenir, she worked closely with a seamstress to design a bag, but as soon as she saw the finished product, the idea hit her: why not produce in Ghana? The products were beautiful, and she wanted to design on her own terms while creating good jobs for the local women. It was the perfect fit. Today the company operates based on Tina’s goal to “empower the women we work with by providing jobs, education and skills training [they can] turn into a lasting, better way of life." 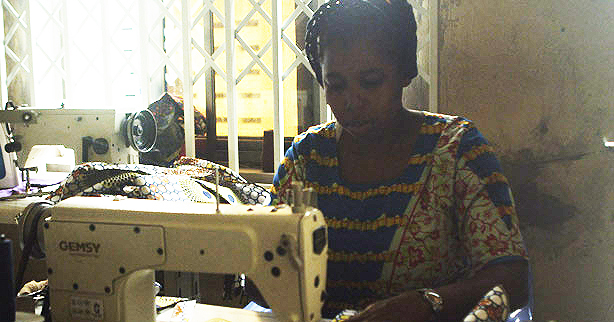 Every product is carefully handcrafted by a seamstress using authentic West African textiles. The result of Tina’s vision is a one-of-a-kind fashion line that blends style with social responsibility. Quite the road map indeed. We’ll be heading on over to the Vans x Della site to upgrade our wardrobes here at AfricanDynamo, look out for more on this exciting new line.